Can you believe we are in the final months of this year? 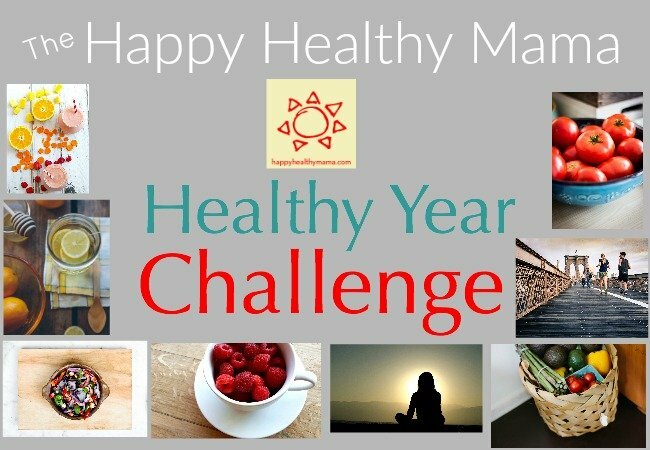 Today marks the final day of the 10th month of our Healthy Year Challenge. Overall, I’m a healthy person, but this year I’ve focused on every aspect of my health more than ever before. I’m so glad I decided to do this challenge and am proud to have stuck with it all year. I’m excited for the next two months, too, and hope you’ll join me in staying focused on our health for the final two months of the year. These months tend to be hectic and stressful, so I think it’s extra important to remember our health. Keep in mind, without our health we have nothing, so don’t give in to excuses of not having time or putting other priorities ahead of your health. YOU are worth it. I made it through almost all of the foods on my Try New Foods list. I planned on updating every week this month, but it just didn’t seem like I had enough to say to warrant a whole post. So let me show you the new, healthy foods I tried this month! This post contains affiliate links. Thank you for supporting my mission! 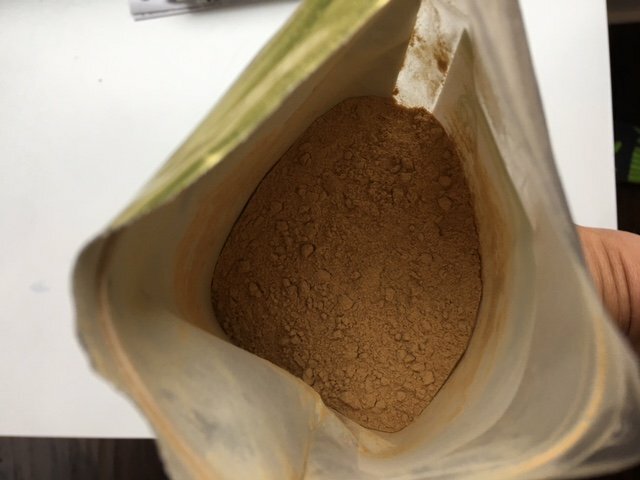 I was interested in trying Maca Root Powder because I’d read about its many benefits. It’s a good source of B vitamins, and vitamins C, and E. It also has calcium, zinc, iron, magnesium, phosphorous and amino acids. It’s said to be great for balancing hormones, boosting libido, helping with menstrual issues and menopause, balancing your mood, and increasing energy. Awesome, right? When I searched for ways to use it, I found it’s commonly added to smoothies, oatmeal, and even soups. I have added it to smoothies and oatmeal so far. It has a bit of a nutty taste, but it’s pretty mild. This is definitely a new food (supplement?) to keep in the rotation. This is one that I’ve seen all over the Internet, but was reluctant to try it as it just seemed trendy and I hate to try something only because it’s the new It thing. After I read about how high it is in antioxidants, I could’t resist trying it. 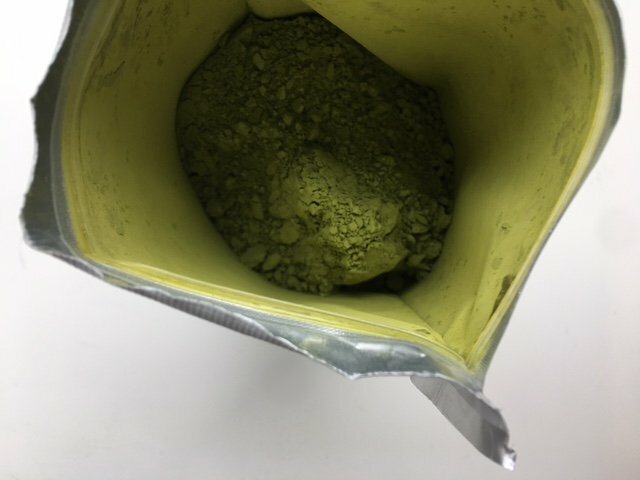 Matcha green tea powder has 60 times the antioxidants of spinach and 7 times the antioxidants of high quality dark chocolate! Look at how green it is! I was actually nervous to try this as the color threw me off. I know that doesn’t make sense as I eat green food all the time. This just looked weird to me. The package had a recipe for a Matcha Green Tea Latte, so that’s what I’ve been making with this. It’s really good! I’ve been enjoying these a few days a week. Antioxidants=good things. This is not one that I put on my original list, but it showed up in one of my Blue Apron meals. I do love how Blue Apron introduces me to unique produce. I loved this squash and even more exciting was that the kids ate it! 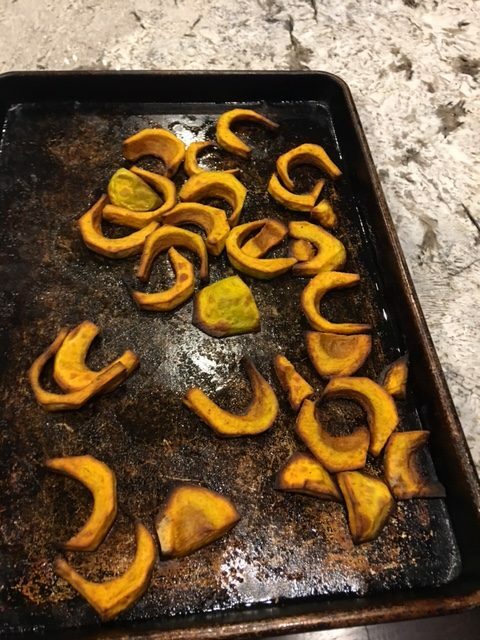 They are not usually big fans of squash but this roasted up nicely and they liked it. The only problem is I’ve never seen this kind of squash in the store. Whomp whomp. 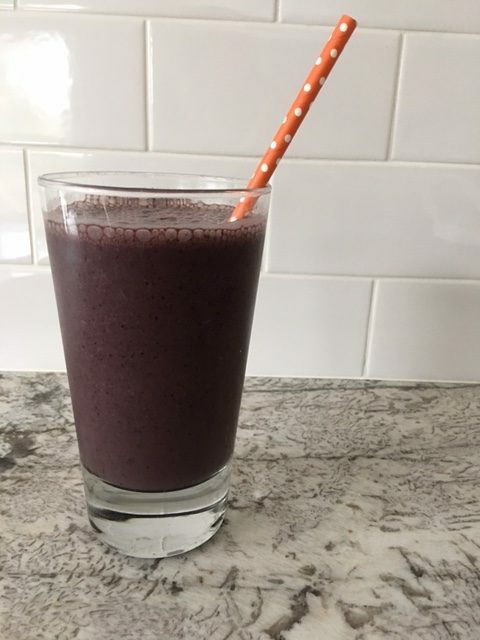 According to Dr. Weil, “amaranth is an especially high-quality source of plant protein including two essential amino acids, lysine and methionine, which are generally low in grains. Amaranth is packed with iron and calcium, and its fiber content is triple that of wheat. Amaranth is completely gluten-free and suitable for those with celiac disease; what’s more, it is an especially digestible grain, making it a traditional food for people recovering from illness or transitioning from a fast or cleanse.” I love trying new grains so I put one on the list I’d never tried. I kept forgetting to put it in the dinner plan, so I decided to make a breakfast out of it. Please excuse the dark, early morning photo. I made this recipe for amaranth porridge. 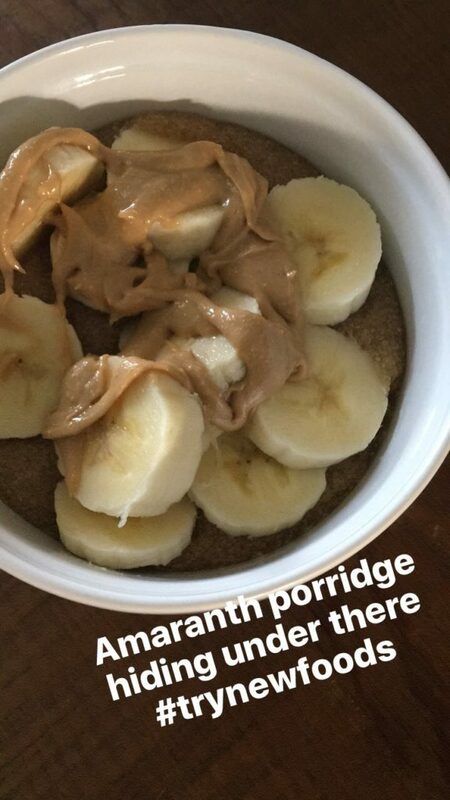 I topped it with bananas and cashew butter. It was…meh. I really didn’t like it at all. The texture and taste were not my favorite. I plan to try it in a more savory recipe before I give up on it completely. It’s good such a great nutritional profile I really want to like it. Kimchi is a traditional fermented Korean side dish made with vegetables and a variety of spices. I found this jar at Whole Foods. 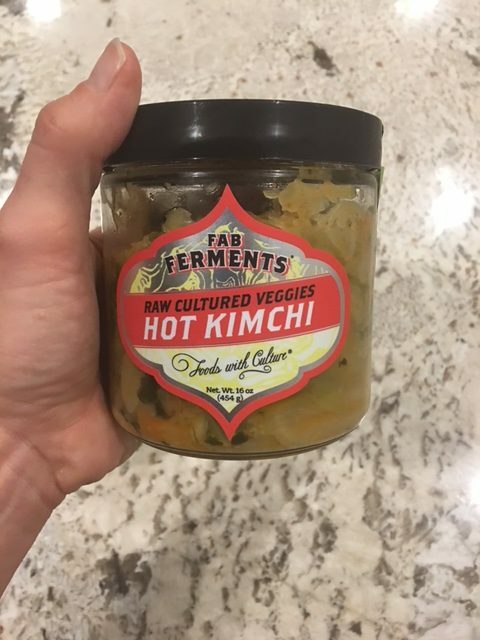 I wanted to try this since fermented foods are so good for our gut health and I know I should eat more of them. (I do take probiotics) I wasn’t sure exactly what to do with it so I googled ways to eat/serve it. I found the idea to add it to scrambled eggs so I did that for breakfast. I wish I could say I loved this. I can’t even sugar coat this. I didn’t like this at all. I could barely finish my eggs. Maybe it’s an acquired taste? Fermented foods I like: sauerkraut, pickles, miso, tempeh, and kombucha. I guess I can’t add kimchi to the list. I hate to waste this jar, though, so I might have to choke it down. Two foods that were on my list but I didn’t try were fresh figs and sardines. I couldn’t find fresh figs at all. I guess I totally missed their season and they aren’t available fresh year round. As for the sardines, I did buy two tins and they are in my pantry waiting to be eaten. Sardines are an excellent source of Omega 3 fatty acids, and, according to the package, “ounce for ounce…sardines provide more calcium and phosphorus than milk, more iron than spinach, more potassium than coconut water and bananas and as much protein as steak. Sardines contain Coenzyme Q10, a nutrient found in the body’s cells and believed to have antioxidant and immune boosting properties.” I’ll admit, I’m a little nervous to try them, but I will in the next few days! May I please make a suggestion? Please give kimchi another chance! Honestly, the one in your picture doesn’t look good, so maybe that’s why you weren’t impressed. Try Mother-In-Law’s brand. I find it at Whole Foods. We make a version of Korean bibimbap with it….white rice, topped with any steamed veg of your choice, some roasted tofu cubes ( I season with Chinese 5 spice, sesame oil, and bake until firm), some julienned cucumbers, a dollop of kimchi and Sriracha if you like. It’s so good. Can also sprinkle with soy sauce, sesame seeds, add meat or fish, and a fried egg. 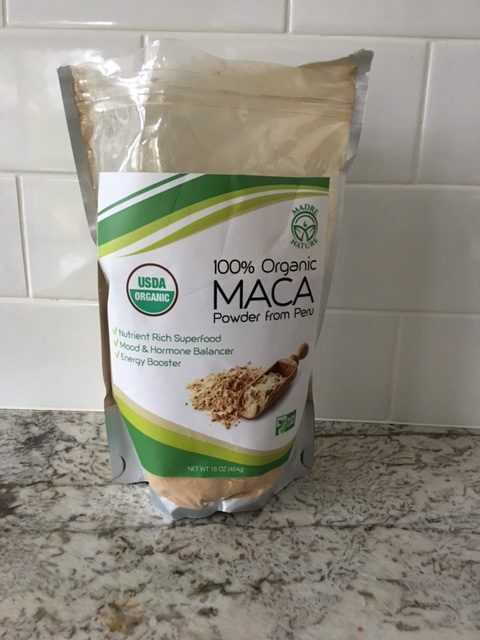 I am going to try the maca, as plantains were on my list this month and I ever got around to them. Oops. I understand completely because I hate to throw food out! Like today I will be pushing bananas on my family because they’re getting too ripe and I already have some n the freezer. Maybe your kimchi will taste better next time. I wasn’t a huge kimchi fan the first time i tried it so I think I need to try other brands as well! 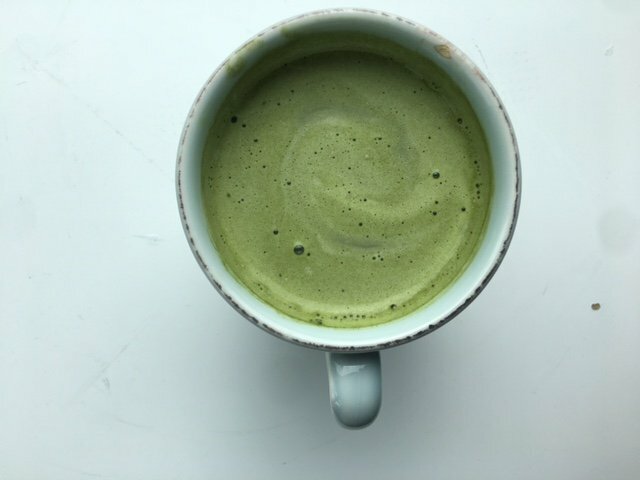 I haven’t experimented with matcha yet myself but I love it when I order it in drinks! So many goodies!! I hope they sell that brand of Kimchi at my WFM- It looks delish! You must already be a kimchi fan!